AuthorMitaliPerkins: Trick or What? Santa Who? Trick or What? Santa Who? I went trick or treating only once. I was twelve and we had just moved to a California suburb. I borrowed one of my Dad's suits, stuffed a pillow down my front to simulate a beer belly, and headed out with my neighborhood buddies. But first, I had to make sure that Mom and Dad were stocked with candy, prepped to answer the doorbell promptly, and instructed about the proper method of doling out treats. American holidays are challenging for immigrant kids. They underline how "foreign" your parents are, make you feel guilty for wanting to participate in the fun, and remind you of your status as an outsider, a stranger, a wannabe. Fusing the old and the new is hard work, but two picture books give kids like these -- and their parents -- hope that it's worth the effort. In Shy Mama's Halloween (Tilbury House, 2000), by Anne Broyles, four Russian children long to go trick-or-treating, but their mother is hesitant. "But I don't know this -- this Halloween," she protests. She prepares their costumes anyway, and the children wait excitedly for Papa to take them out, but he returns home from work with the flu. Bravely, the children face their disappointment as they watch other kids fill the streets with laughter and excitement. But shy Mama rises to the challenge, ties on her scarf, and leads them out into the strange, foreign five-senses experience of Halloween. This beautiful book, illustrated by Leane Morin, reveals the best part of this American holiday -- the chance to connect with neighbors and offer hospitality to one another. An insightful study guide for parents and teachers is included, making the story a great Halloween readaloud for any classroom, especially those with one or two immigrant kids. 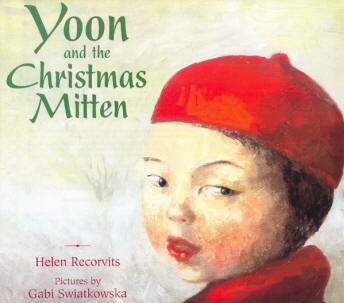 Yoon (of My Name is Yoon fame) faces a similar dilemma in Yoon and the Christmas Mitten (FSG, November 2006), when she wants to hang up a stocking but her Korean parents remind her that they "are not a Christmas family." Sensitively and graciously, Helen Recorvits captures the struggle of a young child who longs to participate in American life and honor her parents at the same time. Yoon's parents' efforts to bridge the gap between cultures reveals the imagination and flexibility needed to fuse two traditions. Gabi Swiatkowska begins the illustrations with Yoon looming over her mother and standing apart from the much-smaller figures of schoolfriends playing in the snow. By the end of the book, everyone is the same size, with a smiling, lovely Yoon smack in the center of every spread. When artists discover as children that they have inappropriate responses to events around them, they also find, as they learn to trust those responses, that these oddities are what constitute their value to others.